While the trend from inpatient to outpatient care has been an increasingly common method of healthcare delivery for some time now, including services ranging from primary care, to specialties such as oncology, surgery, and imaging, emergency care has traditionally been viewed as a component of the inpatient hospital, and often seen as a contributor to inpatient admissions. The nature of emergency care has evolved in recent years from a dedicated, life-saving inpatient care portal, to a more multi-function based treatment center, serving not only as traditional emergency care, but also as many patients source of primary care, including non-critical urgent care. Increasingly seen as a community’s “front door” to healthcare services, healthcare providers have been looking for ways to position the emergency department as a more effective contributor to the needs of the overall community. The recent emergence of freestanding, 24/7 emergency centers has been an increasingly preferred and popular delivery model to address these changing needs. 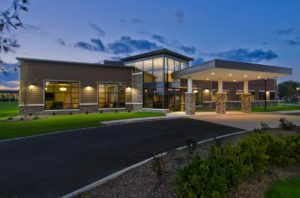 Located out in the communities, close to the patients they serve, and away from the inpatient “mothership”, these centers are providing full service, around-the-clock community-based emergency care in a convenient, smaller, and less intimidating package than the traditional hospital-based emergency department. Many of these newer facilities are taking the concept even further, and providing primary care, urgent care, geriatric care, and observation units under one roof, often with extended hours, to maximize patient convenience and access. These new emergency centers typically treat only the more routine emergency cases, which lets them eliminate many of the acute level trauma services associated with hospital-based emergency departments, and their associated high costs. To continue to provide timely and life-saving access to those trauma services, if needed, most new freestanding ED’s have helicopter landing pads to facilitate the transport of those patients needing the higher level of trauma care. Andrews Architects is pleased to be a leader in the design of this new delivery model, having planned or designed over a half-dozen such similar projects over the last several years.